Yesterday I went to lunch with my son and my dad at a deli in a wealthy part of Kansas City. Everyone always seems so put together there, and I always feel out of place. No surprise. My car wasn’t clean, and John and I were wearing cut-off jean shorts and sandals. Oh well. We sat down to order, but John started his shark thing where he never stops moving. The waitress brought us crayons and paper, and we begin to feel more at home. Not long after we sat down, a good-looking, middle-aged man was seated at a table next to us. As he pulled out his chair to sit, I looked up at him and the thought came to mind: “He has back pain.” Weird. He didn’t look like he was in pain. Maybe I was making this up. But I know to pay attention to these thoughts. As usual, I so did not want to get up and pray for this guy right in front of the whole deli. So to take up time, I argued with myself. Since my last impression about a stranger was related to back pain, I countered, “Sarah, you think everyone has back pain.” But obviously I didn’t get that impression about everyone else in the deli. The man and his possible back pain bothered me through the rest of the meal. Especially when his attractive wife showed up to join him. I just didn’t want to pray right there, right then. And what if he didn’t even have back pain? I was going to look weird either way, and we already stood out, and people in this part of town don’t do well with weird. As we finished our sandwiches, my dad picked up the tab, and we said our goodbyes. The man was getting ready to leave as well. Internally, I groaned. If I was going to do something, time was running out. I did nothing. John and I walked to the bathroom, and the man walked out the door. As the door swung shut behind him, I saw him wincing in pain, his hands straightening at his side. So he was in pain. The bathroom was occupied, and I thought maybe I had one last chance. I walked toward the parking garage where I thought he might be, and I saw him walking toward his car, quite a distance away. I would have to shout. I suddenly had too much dignity to shout. But what if God could heal him? What if he could walk away from here without pain? Wasn’t that worth a little weird? I thought, finally a little bit sane. John pressed the UP button on the elevator, and we waited. I saw the man driving toward us, and I knew, if I was just crazy enough, I could stop him in the garage and pray for him right there. I’d already come this far, practically chased him down. But my feet were stuck. My mouth stayed shut. The elevator door swung open. John and I didn’t enter. The elevator door shut again. The man and his big blue car drove past. John pressed UP one more time. And I knew he was gone. We entered the elevator with another mom and baby, and I tried to smile. But I was heartbroken. I was scared, and a man left the deli in pain. He didn’t have to, but he did. Because I went into self-preservation mode and forgot who mattered. He had a beautiful wife, nice clothes and a big, cushy car. But you can’t buy health. And you can’t buy peace. And I had that to offer. And that’s why I feel for the cowardly lion. I am a lion who forgets who she is. I think fear is the safe bet so I stay under its umbrella. 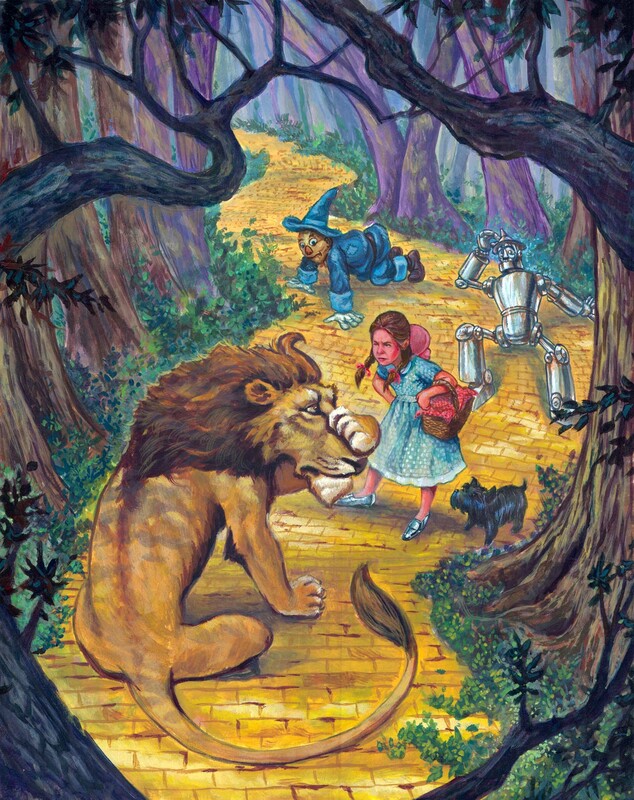 We all miss out when we play the cowardly lion, when we forget who we are. My heart felt like a stone on the drive home. I wondered if God would maybe let me see him one more time, some crazy way, but I knew I needed to sit in this. I knew I needed to feel the pain, the wages of fear. It still feels sad to say. I wish there was a happier ending. But please, be brave today. If God shows you a person who needs something, offer the time or the prayer or the presence or the money. Don’t be fearful. Don’t be stingy. Don’t let your heart shrink. Instead, remember who you are. You are a lion. You might be cowardly at times. But you are still a lion. And that’s a very powerful creature, whether you believe it or not. When are you most likely to play the cowardly lion? Tell me in the comments below. I’m a cowardly lion every time my yard fills up with kids who are bigger than me. I’m afraid to engage them in conversation and I’m afraid to appear weak. Thanks for being vulnerable and honest, Sarah. I was your totally blind, non-perceptive dad/lunch companion, just chowing down on my pastrami sandwich. I had no idea that guy had back problems until I read this just now. This is a great, honest story, Sarah. He seemed totally together, like you said – smiling at little John. I had no idea. It’s great that you tried to reach out to him, even if it was belatedly. I wasn’t even tuned in enough to notice. I’m proud of you just for that.